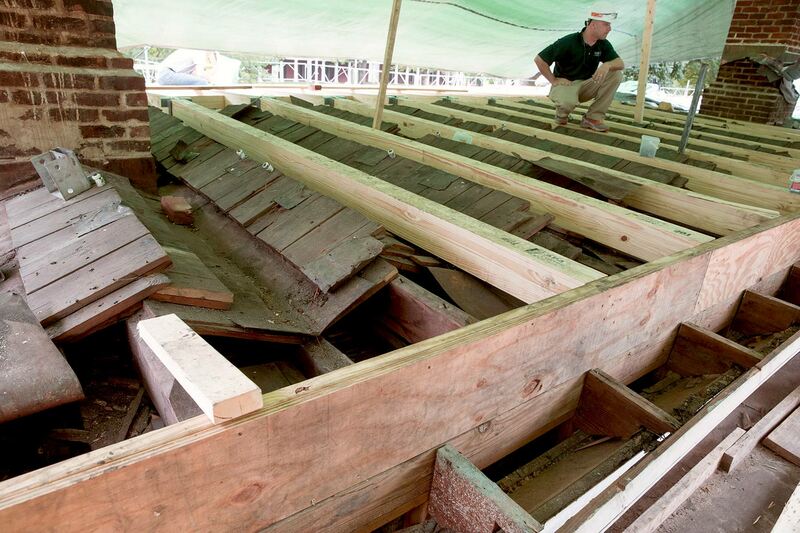 This summer, University of Virginia carpenters are recreating a Jeffersonian roof on top of an original Jeffersonian roof. When Thomas Jefferson designed UVA’s Academical Village, he envisioned flat roofs over the student rooms. “Jefferson liked flat roofs, so he designed a serrated roof covered with a deck,” said James D.W. Zehmer, historic preservation project manager with UVA’s Facilities Planning & Construction Department. “The water was supposed to run through the deck boards and into the valleys of the wood roofs. In the 1830s, University carpenters installed pitched slate roofs over the Jeffersonian roofs, which had two effects: They stopped the leaks, and they covered and preserved the originals. Nearly two centuries later, crews working this summer between Pavilions V and VII are restoring the appearance of Jefferson’s original design with contemporary materials, while continuing to protect the original materials. 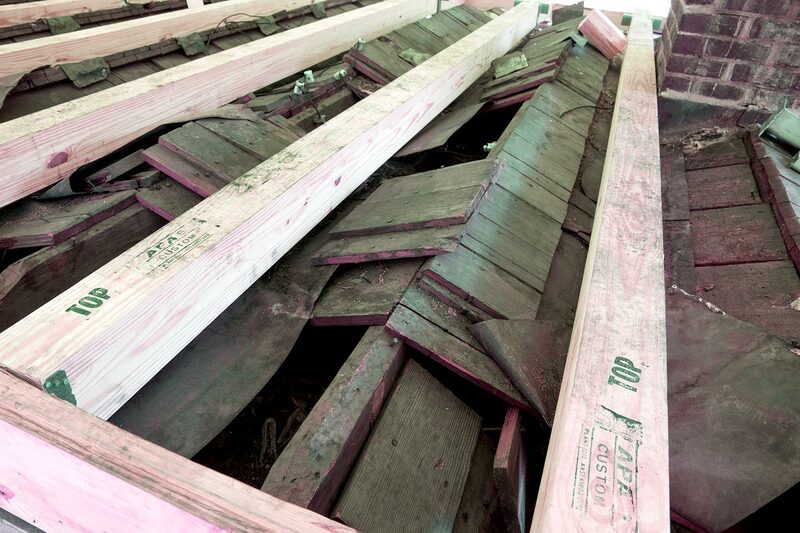 The first Jeffersonian roofs were made of heart pine; the new roofs will be sheets of plywood sheathing with a rubber membrane glued to it, with one-inch-thick sleeper joists supporting decking made of Brazilian walnut. The University replaced a similar section of roof between Pavilions VII and Pavilion IX in 2010. Among the variations were long boards overlapping each other and shingles with grooves carved in them to channel water. This summer’s project also includes replacing the Chinese railings on the elevated walkway over the student rooms. While Jefferson’s railings were wooden, they gave way to cast iron railings in the second half of the 19th century. Wood railings returned in the 1970s. 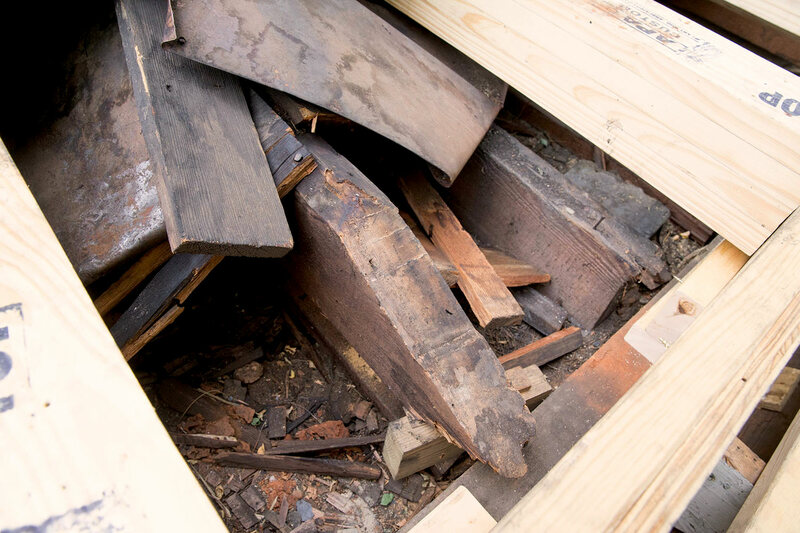 When working on the roof, Zehmer found a wooden pin that may have been part of the original Jeffersonian railings. He said the pin, about three inches long, was painted on both ends, indicating that it spanned the thickness of the original heart pine railing posts. The pin would have been used to secure the mortise and tenon joint between the railing and the post, and verifies the thickness of the posts of the current design, which are three inches. The new railings will be made from mahogany. Once the roof work is done, plasterers will restore a ceiling above the colonnade walkway in the same area. Zehmer said the original design called for plaster ceilings, but he thinks the leaky roofs made the plaster ceilings difficult to maintain, and they were replaced with an open-framed ceiling. Zehmer said the plaster will be done in the traditional way, with an installation of lath, then three layers of lime plaster, mixed by hand, with the addition of goat hair as a binder. Zehmer said this work will be performed in September and October, after the roof work is completed. Crews are also working in the student rooms, repairing damaged floor boards, stripping and refinishing the floors, replacing old plumbing and wiring as necessary, repairing and painting surfaces, inspecting and cleaning the chimneys, and cleaning and refinishing the room furniture as necessary. Kutney also noted that the doors to the rooms are being changed.